With the 80s craze came a lot of repurposed merchandise – stuff that for the previous decade’s boom had been sold as kung-fu gear now emblazoned with ninja logos. The above looks to have been a Chinese-esque design probably inspired by something David Carradine tossed around on network TV. But any 70s leftovers were given new life in the “ninja star” obsessed 80s. The notion of shuriken pendants wasn’t exclusive to this company, either. In the dodgy swap meet, dirt mall, subway blanket, Chinatown video store realm you’d see full-size, razor sharp throwing stars with tiny holes hastily drilled into them somewhere to technically make them jewelry, not illegally sold weapons. I also like their observation for item #704A – A black stick is invisible at night! 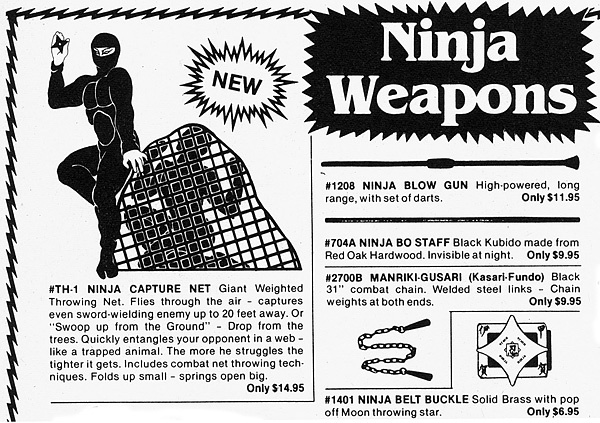 Nothing however, beats my all-time favorite piece of repurposed merchandise, the Ninja Boomerang.